← The Secret History of Reese’s Pieces with Peanuts! When researching the history of candy, I sometimes come across things I’ve never seen before or didn’t previously know existed. It often happens when I’m lucky enough to find a vintage store photo showing a candy display or aisle. 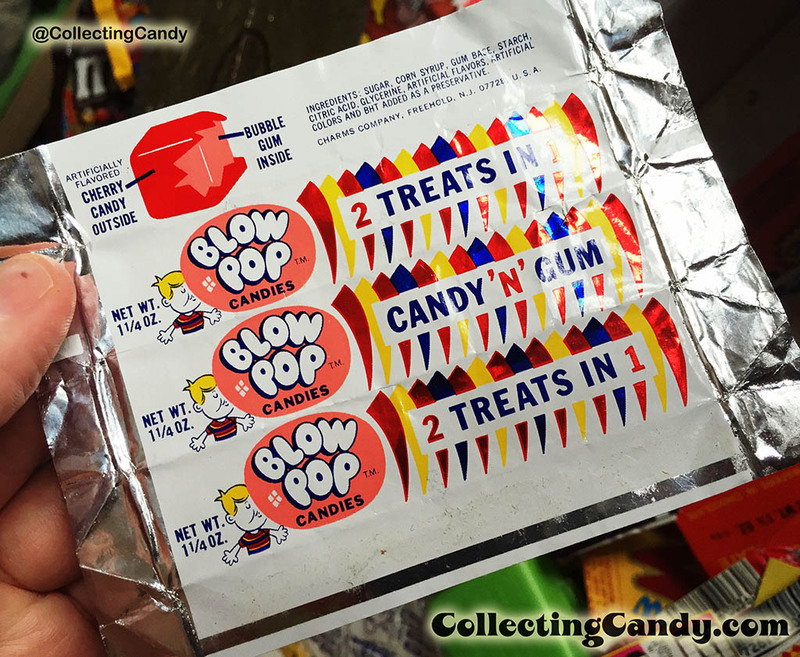 Today I’ll be sharing the story of my discovery-via-photo of the little known 1970’s Blow Pop Candies “Squarepack” along with its connection to Blow Pop’s earliest origins. Make the jump to check it out! 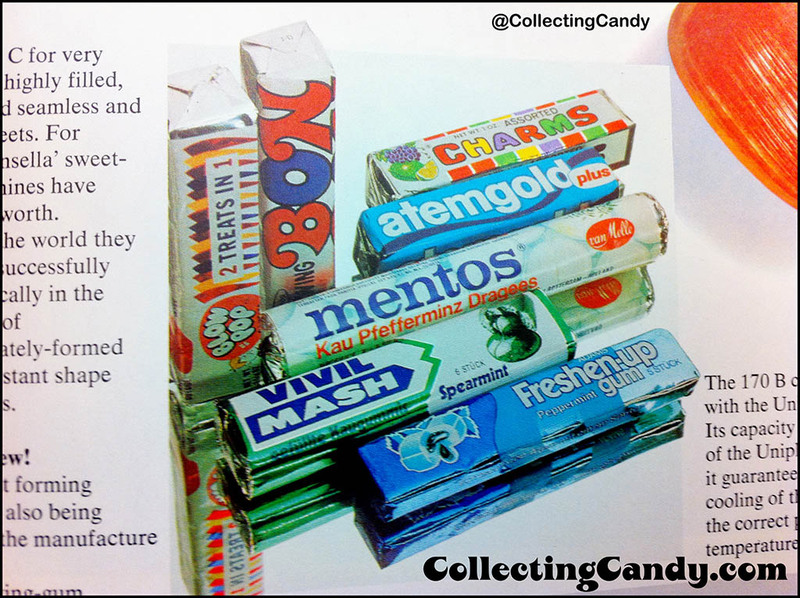 I spend much of my research efforts in the quest to document the lost and forgotten parts of confectionery history (i.e. the things you cannot find online), which leads me down many paths. One of the most obvious of those paths has been quite a few trips to libraries. 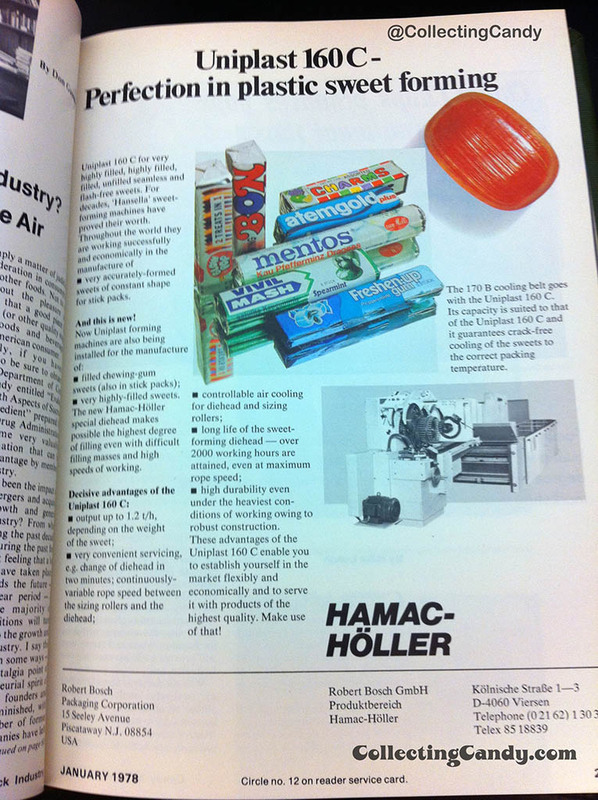 I was delighted to finally find some quality photos of vintage candy product shown (there were LOTS of photos of machinery in this particular collection of trade magazines). But what really caught my eye was something I’d never seen before… a soft-chunk style square foil pack featuring the Blow Pop logo! Up to that time, I’d never come across any images, references or evidence of any kind that such a product existed and I had no personal memory of it from the era, either. I was amazed and intrigued and I wanted to learn more. The magazine was dated January 1978, so I assumed the product was on shelves by 1977, and the square pack format lead me to a series of deductions. You see, just a few years earlier Bubble Yum bubblegum had launched in the United States, and it was one of the biggest sales hits in the history of bubblegum. 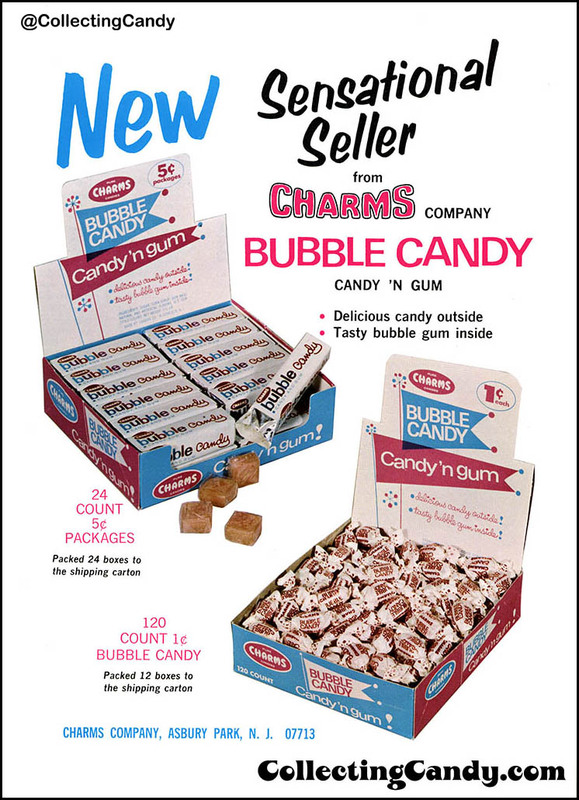 Bubble Yum’s launch of the “soft chunk” bubblegum category lead to historic sales levels, along with every other gum manufacturer rushing to get a competing product on shelves. So it was easy to see where the Charms Company (maker of Blow Pops) saw an opportunity to offer their signature bubblegum pop in a format and package familiar to the hordes of new soft chunk bubblegum fans. 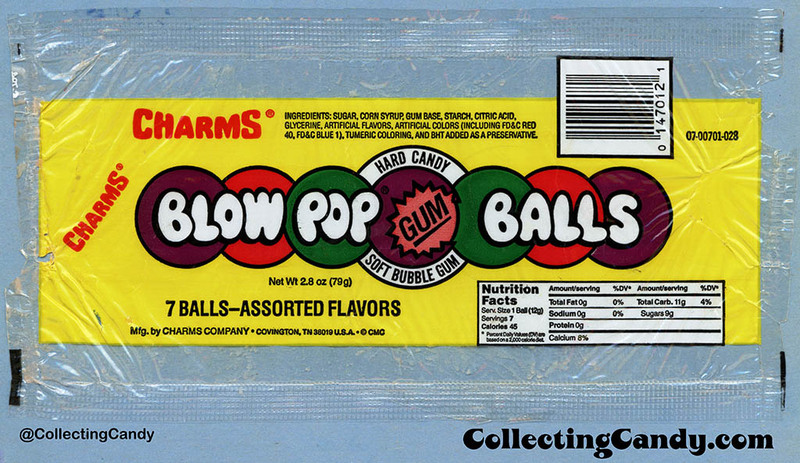 And finally, just over a year ago, I acquired a small lot of candy packaging and wrappers from the late 1970’s to early 1980’s – and within that small group of items was a near-perfect example of one of the Blow Pop Candies wrappers. After five years of searching, I finally had the piece in hand and it was beautiful. 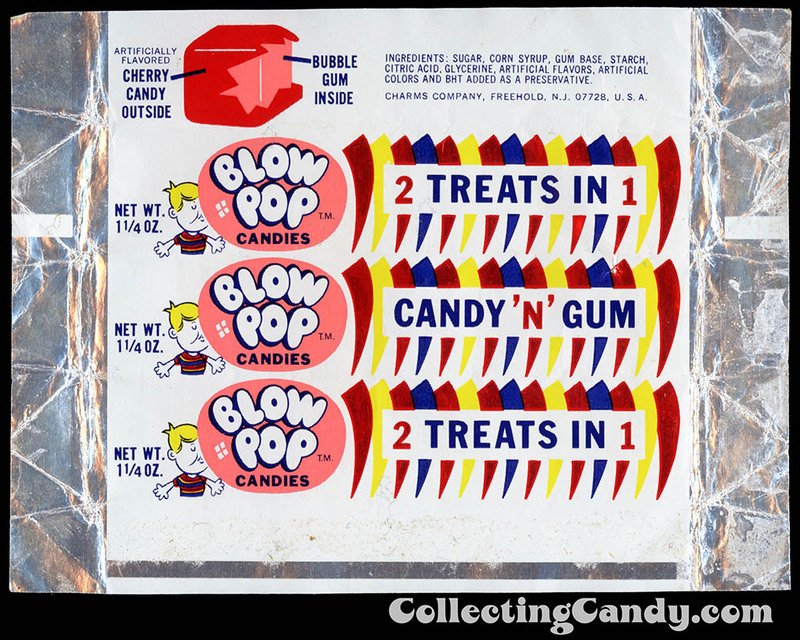 It is a particularly appealing vintage wrapper, featuring the classic “kid mascot” from Blow Pop packaging along with striking spots of colored foil showing through. 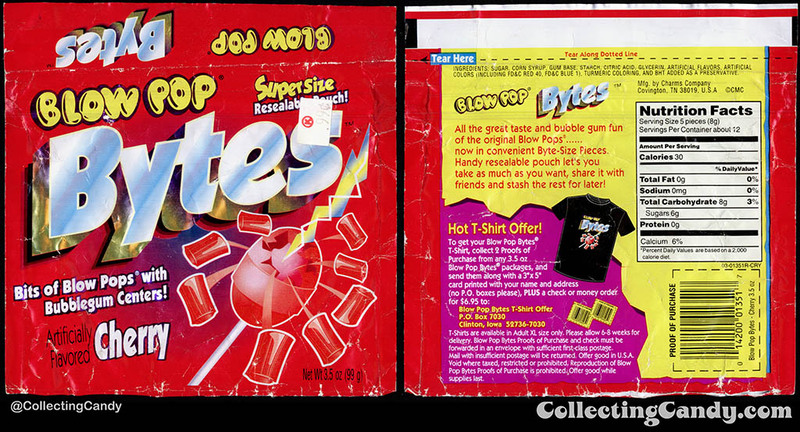 It’s so great to not only discover a piece like this, what is essentially a long-forgotten extension of the iconic Blow Pop brand, but to be able to document it and share it. 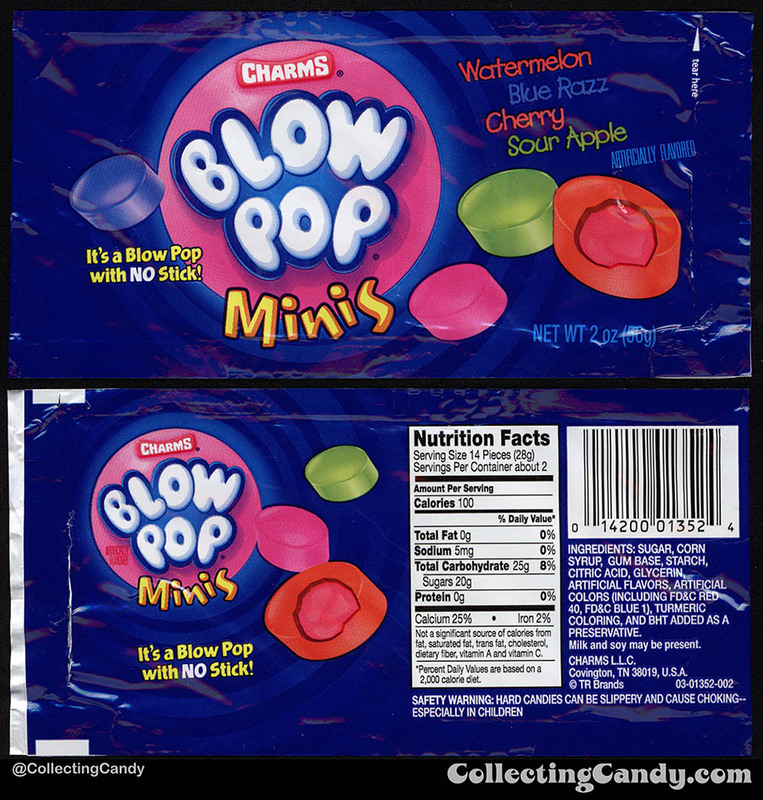 Just as exciting, after more research, I’ve learned that even though “Blow Pop Candies” were a spin-off of the Blow Pop, the underlying format of the Blow Pop Candies square pack may have been responsible for the initial creation of Blow Pops themselves. That might sound confusing and the thread of this historic tale risks becoming serpentine, so I’ll endeavor to keep it as clear as possible. We’re going to jump back to Blow Pop’s origins, before we jump back even further to my full-circle theory of invention. That clipping mentions early TV commercials featuring Henny Youngman as “The Professor”, but unfortunately it appears that none of those commercials have been archived and uploaded to the net. For now, we’ll just have to imagine what they were like but if anyone finds them, please let me know! 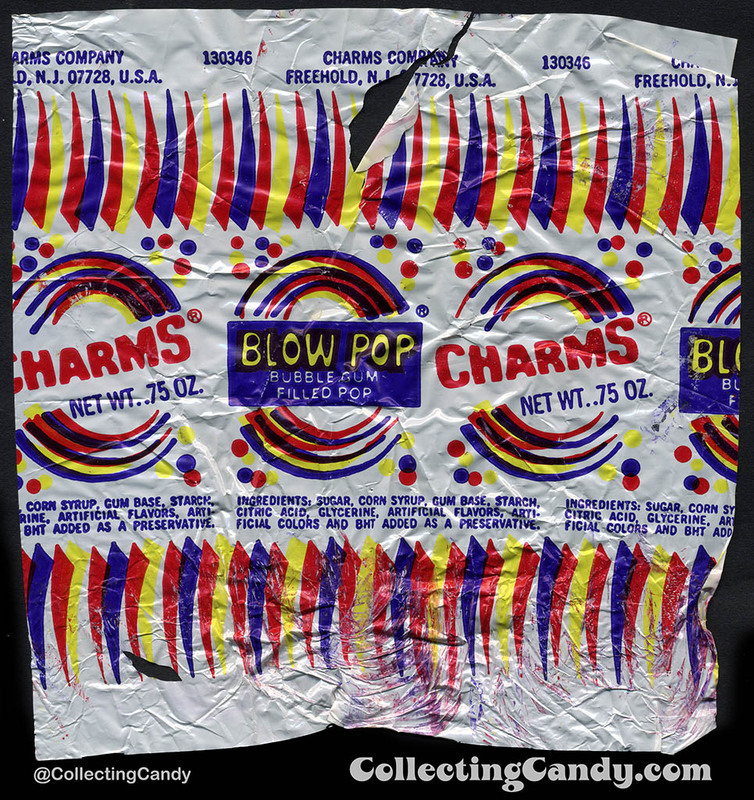 I should note that while individually-sold Blow Pop wrappers do feature a somewhat updated design, if you buy bags of classic Blow Pops, the wrapper design used within those has barely changed from the version launched in 1971. It’s a remarkably consistent package design. 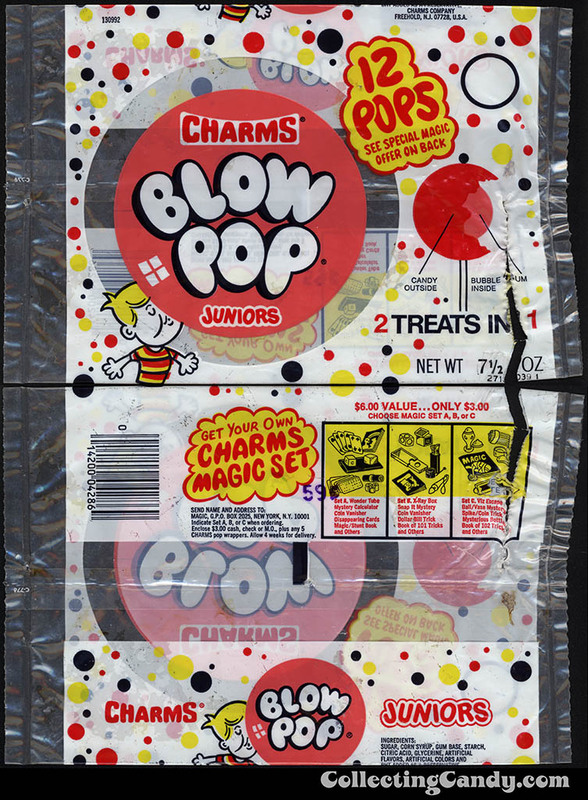 So, Blow Pop Candies were a spin-off of Charms Blow Pops which were an evolution based on Charms Bubble Candy which was the same product that would eventually become Blow Pop Candies. Or something. Whew! Finally, around 2009, Blow Pop launched Blow Pop Minis, which have managed to become a staple, every year since. 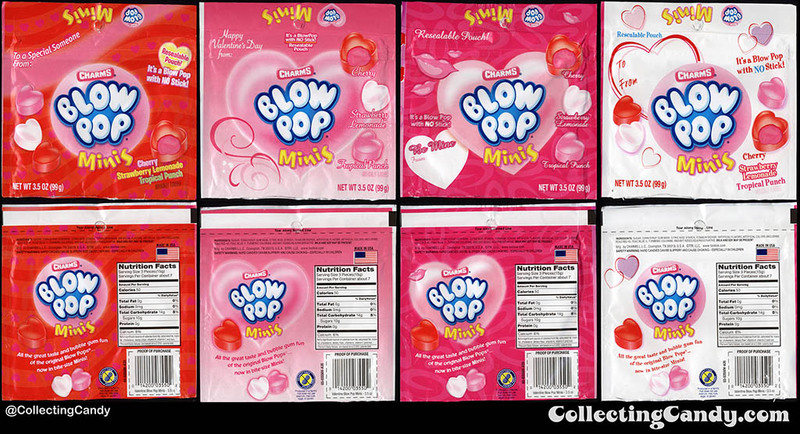 The larger re-sealable Blow Pop Minis pouches have become a part of holiday assortments for a number of seasons, as you can see with this Valentine’s lineup from a few years back. If you’ve made it this far, I hope I’ve successfully and clearly shown how my search for the previously-lost-to-history Blow Pop Candies “Squarepack” not only allowed me to document that individual piece, but also provided me an anchor to explore the very earliest origins of the Blow Pop brand, along with some of its later descendant spin-off products. 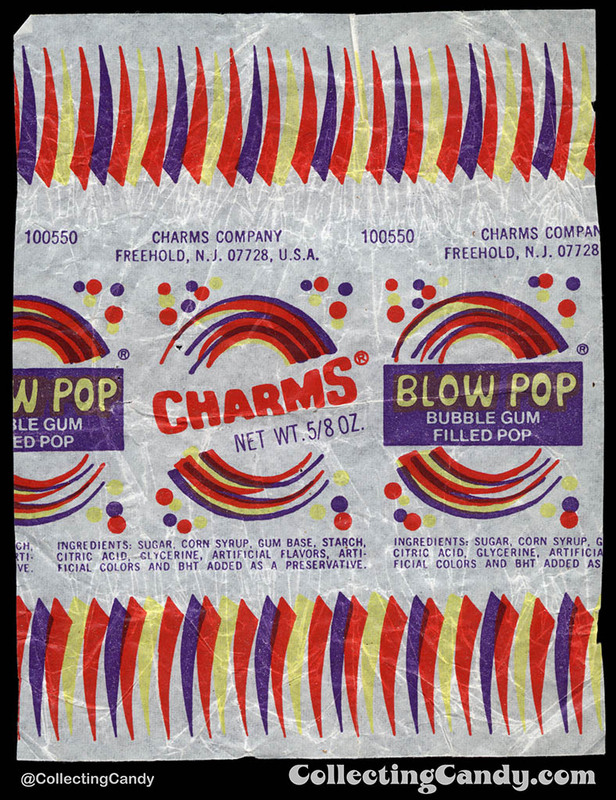 And that is everything I’ve got on my finally-successful search for the 1970’s Blow Pop squarepack, and the earliest origins of the iconic Charms Blow Pop. See you next time! 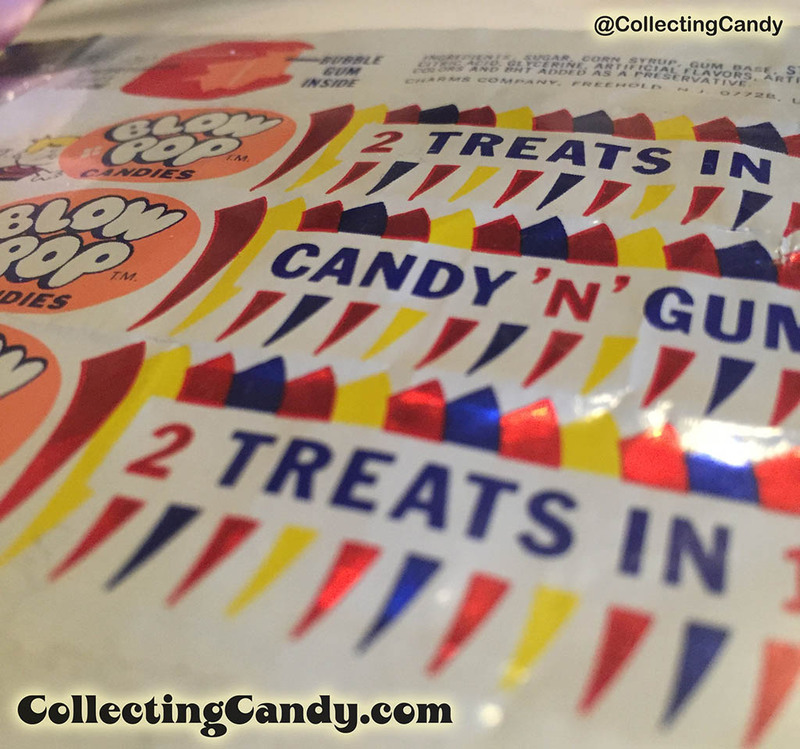 This entry was posted in 1960's, 1970's, 1980's, 1990's, Bubble Gum, Gum, Hard Candy, Lollipop and tagged Blow Pop, bubble gum, bubblegum, candy collecting, candy collection, candy collector, candy wrapper collection, candy wrapper collector, Charms, collectible, collecting candy, confectionery, confections, gum, packaging, packaging design, sweets, vintage candy wrappers, wrapper. Bookmark the permalink. 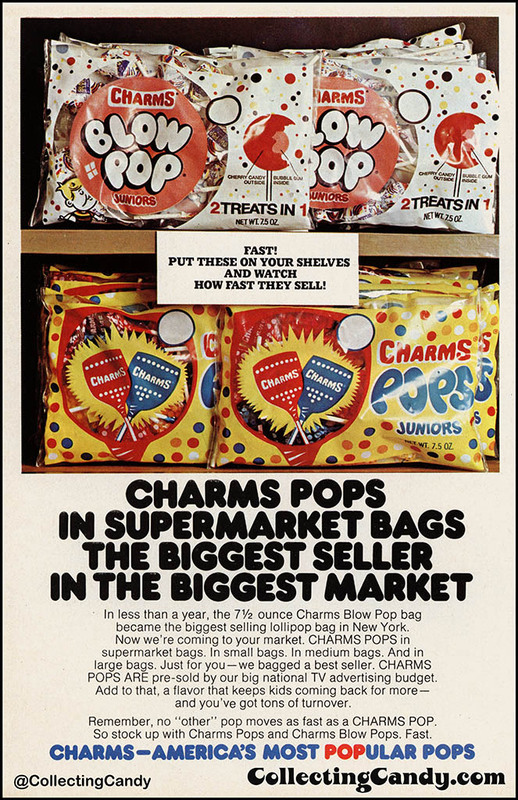 3 Responses to The Search for the 1970’s Blow Pop “Squarepack” and Charms Blow Pop’s Earliest Origins! I clearly remember buying the square pack of Charms candies at the local dime store! This was very small town Nebraska, mid to late 70’s! 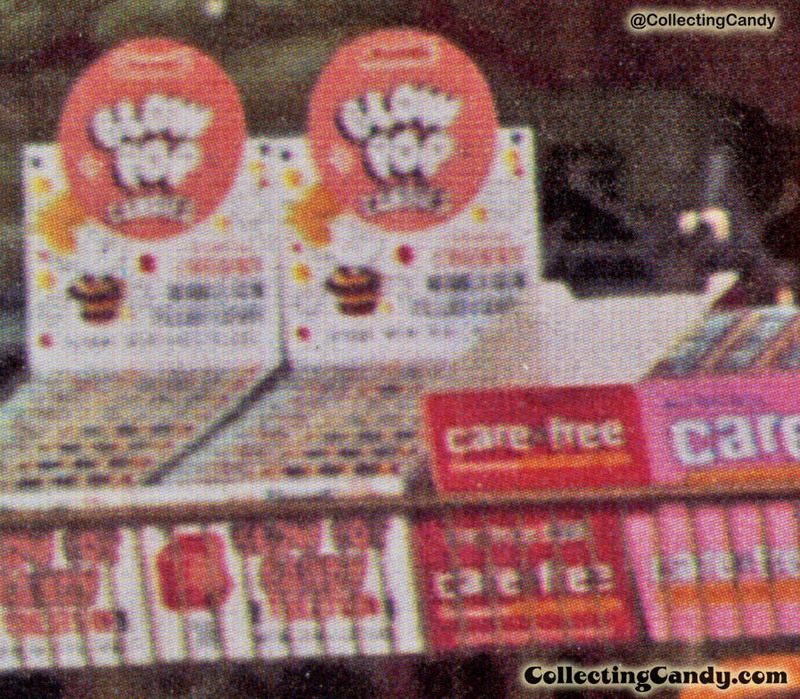 I had completely forgotten about the blow pop candy I loved in the 70’s until a few weeks ago. I was at a Mast General store in NC and they had the Charms candy – in a cube package. 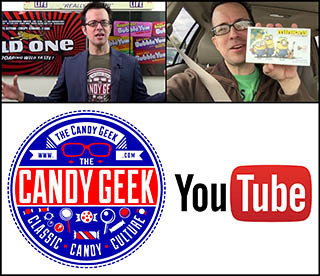 I was SO excited, until I discovered there was no gum in the center of the candy. I’ve been on a search for it ever since. I thought that I may have imagined it all. You’re right – this is the only place I’ve been able to find any information on it. I wish they’d bring it back.